During his Hanover visit the US president paid tribute to German Chancellor Angela Merkel’s foreign policy. But eight years after Obama’s famous Berlin speech, his offer to Europe to join forces in a new multilateral era has still not been taken up. 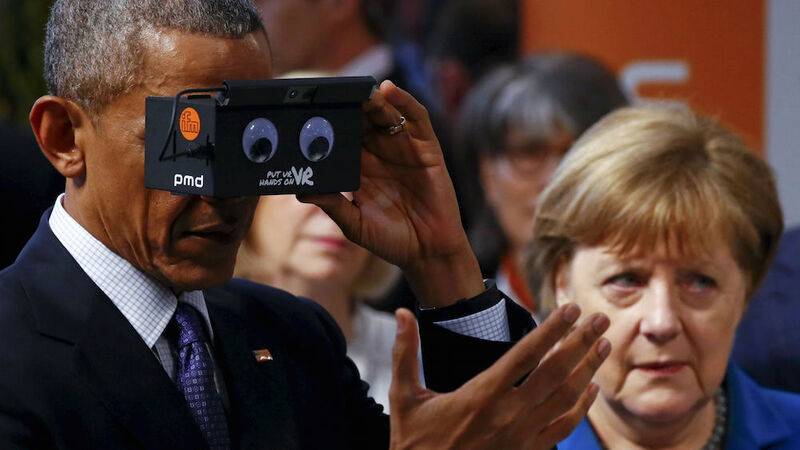 There was an air of déjà-vu all over again as US President Barack Obama concluded his fifth – and probably final – visit to Germany on Monday. In 2008, as a young senator and presidential hopeful, Obama promised a euphoric Berlin crowd that, if elected president, he would end the unilateralism of the early Bush years. “No one nation, no matter how large or how powerful, can defeat such challenges alone,” he said at the German capital’s Victory Column. It was a softer version of the damning verdict delivered in a recent interview, in which he described Europeans as “free riders” on US security and military heavy lifting. And he leaves office with a dim view of his European partners, one shared by all his recent Oval Office predecessors – and this despite a clear and present security threat. Ahead of July’s NATO summit in Warsaw, Obama’s last visit to the continent, the president warned his European partners that their threadbare excuses on defense under-spending were no longer acceptable. If threats from Russia and the so-called Islamic State were not tackled with European verve, he said, they would poison an already tense European political debate where populists ride a wave of discontent over economic divisions and globalization fears – magnified by the refugee and migrant crisis. Europe’s only sensible future was a united one, he said; allowing divisions would lead to “oppression, segregation, internment camps, and to Srebrenica” – the 1995 genocide in which 8,000 Bosnian men and boys were murdered. It was a hard-hitting intervention by the US leader during a visit with lots of rhetorical carrot and stick. Before Obama arrived in Hanover, some 50,000 people protested against TTIP – which they dubbed “Trojan Tricks in Political Business” – fearing that the deal will prioritize US economic interests over EU legal standards. The US president said he understood the fears of globalization’s critics, saying that “if neither the burdens nor the benefits of our economy are being fairly distributed, it’s no wonder that people rise up and reject globalization.” In the final months of negotiations, however, he urged renewed political efforts to show how a US-EU trade deal would lift all boats and tackle “hypothetical” fears that an agreement would sacrifice EU social standards for US economic interests. At a press conference with Chancellor Angela Merkel, with whom he has worked longer than any other world leader, a reflective Obama recalled their joint efforts to avert a global economic meltdown, prevent Iran gaining nuclear weapons, and secure the Paris climate-change deal. He brushed over the Snowden unpleasantness, described German troops as “vital” in securing stability in Afghanistan, and paid tribute to Merkel’s leading role in the crisis diplomacy between Russia and Ukraine. The US leader also predicted that Merkel’s stance in the migration crisis will put her “on the right side of history.” “Perhaps because she once lived behind a wall herself she understands the aspirations of those who are denied freedom,” he said of the East German-raised leader, under domestic pressure for welcoming one million asylum seekers last year. But on the knotty issue of Berlin offering a greater defense heft, the US leader left Germany empty-handed. Instead of leaving the US to pick up the slack, as usual, he called on the EU in general and Germany in particular to step up its engagement to fight IS in Iraq and Syria. Obama announced a quadrupling of on-the-ground special training forces in Syria, leaving Merkel on the defensive about how far Germany had come in recent years – arming IS opponents in Syria and flying reconnaissance missions over Iraq. But in 2008 she offered similar special pleading, telling Obama during his visit that there were “limits” on how many troops Germany would send to Afghanistan. And similar arguments were likely made at Obama’s closed-door Hanover meeting with leaders from his British, French, and Italian NATO allies. His presidency still has some months to run but, despite eight years of effort amid a constant stream of new terrorist threats, Obama must have left Germany disappointed that his promise to end US unilateralism in 2008 has yet to be met by a real European readiness to join forces in a new multilateral era.